I’ve been meaning to blog this for pretty much a month now! Sorry this is so late! 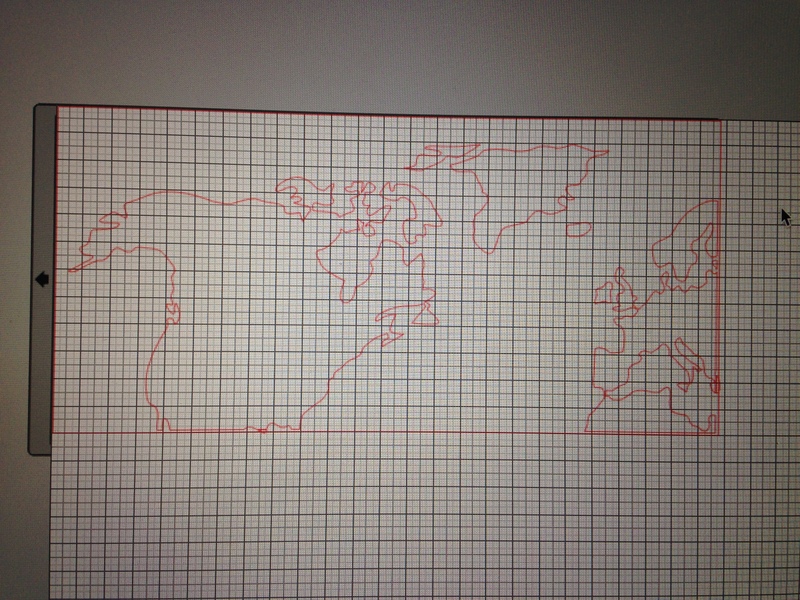 I’ve had a lot of questions about how I did this large world map. It’s no secret that I use the Silhouette Cameo to cut stencils for projects like this, but the catch is, the Cameo only cuts 12″ wide. 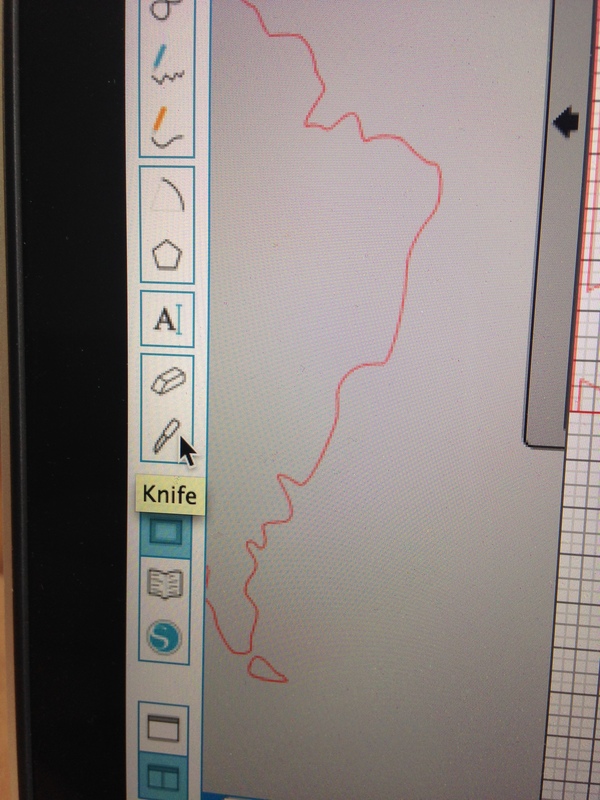 So basically I had to design and cut this like a puzzle in many (i think 4 or 5) sections. Before I ge t into those details, I just wanted to share quick how I did these wood planks that were old fence boards once upon a time. First after cutting the boards I drilled holes on each side. Then i stained some of the boards with grey stain and some with antique walnut both by Minwax. Once they were dry I used FAT’s dark wax over the boards and concentrated it in the drill holes to make it look like it wasn’t freshly drilled. so Voila! i was so happy with how these old fence boards turned out! So back to where it all started. First thing first. I had my map shape on the Silhouette Studio and sized my board to be the size I wanted my sign to be. 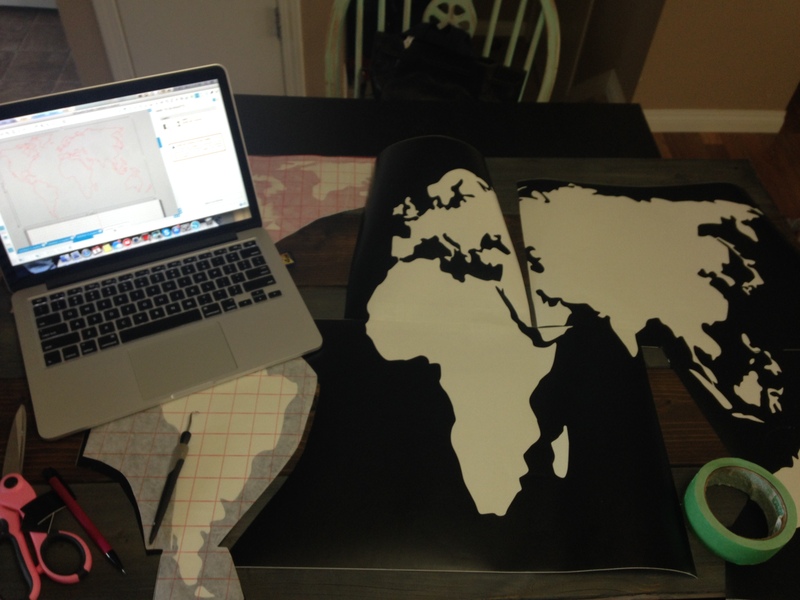 I have a 12×24 cutting map so once I measure out the size of map that I wanted I began cutting the map into 12×24″ pieces using the knife tool. Then I copy and pasted the rest of the map that didn’t fit on the 12×24 page to a new page and continued to do so until it was all ready to cut on about 4 or 5 separate pages! I hope that makes sense! 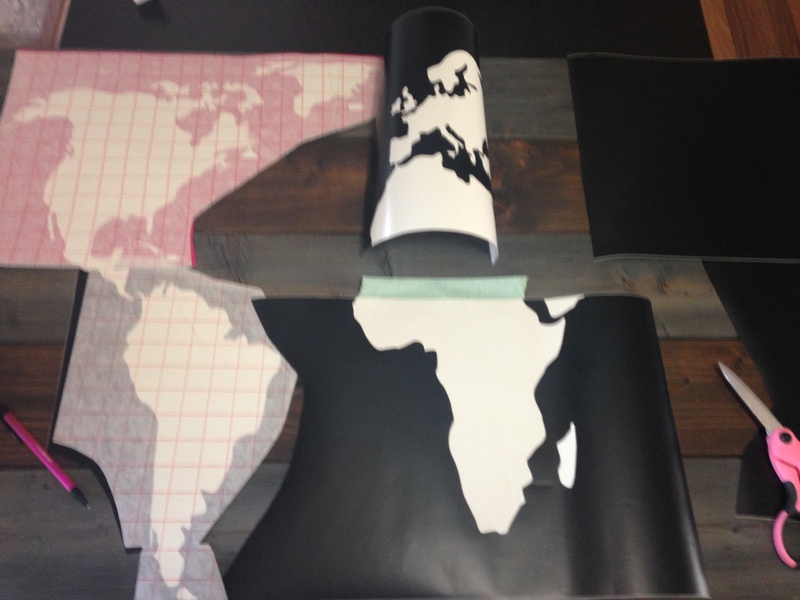 Once everything was cut on vinyl I pealed away the landmasses and used the outline as my stencils. It was tricky measuring out and piecing the puzzle together evenly, but it just takes patience and attention to detail. 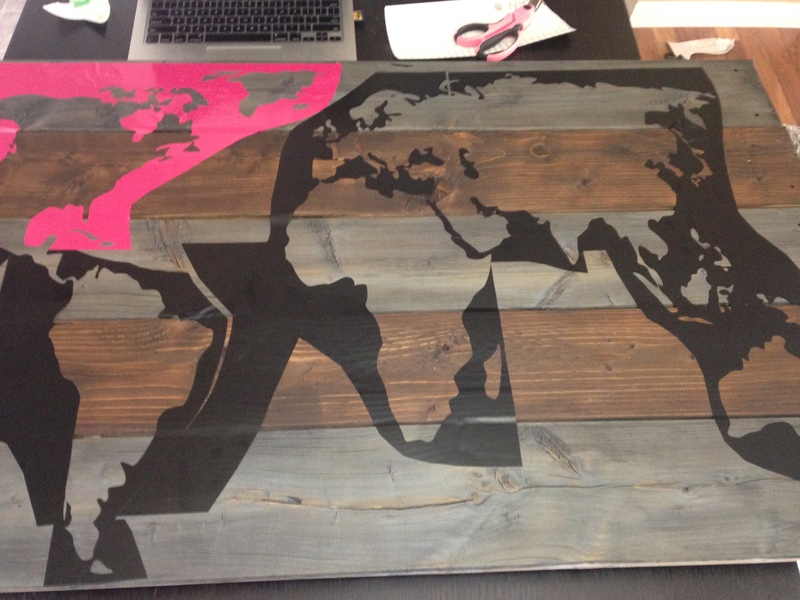 I had my computer with the full map open so I could keep referring back to it as I laid my pieces over the wood sign. I trimmed down my stencils that were still attached to transfer paper and then taped the upper and lower pieces of each land mass together from underneath, mainly to keep the pieces together and be able to space everything out properly. Here’s how it looked once I had it all stuck to the boards! From there I made sure to seal the inside edges with mod podge that I thinned down with water a little bit. Once that was dry I applied a couple layers of white paint, and when the paint was still a little bit wet I peeled the vinyl away! Sometimes little bits of your paint might peel up with your vinyl or some of the paint might bleed (especially if your wood is bumpy or uneven) but thats an easy touch up with either a paint brush or a light sanding. 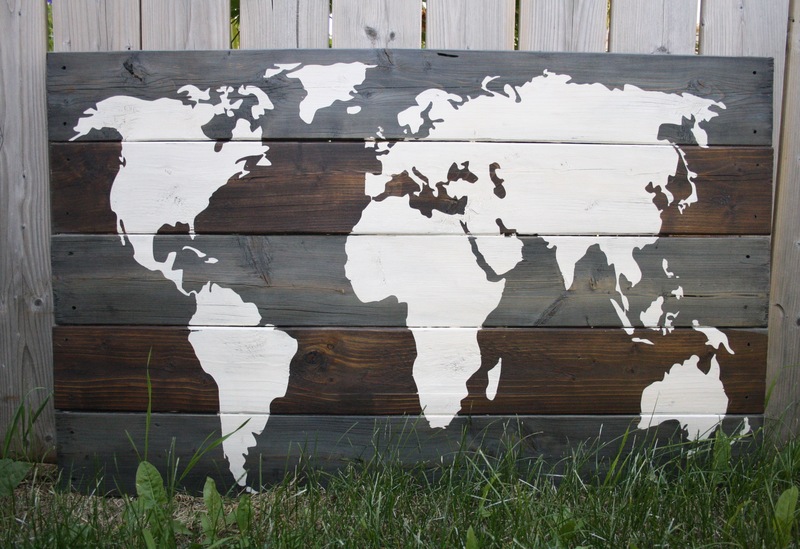 To finish the project i did do a light sand over the land masses to distress them a bit and then I applied a dark brown wax to make the land masses not so stark white, but more worn in with the boards. So there you go!!! I hope that was clear! I likely missed something and I hope it wasn’t too confusing! Please ask questions if you have any and I’ll do my best to answer them! A lot of times I just make things up as I go but I’m always willing to share my methods!! !